*As of May 11, 2016 this formulation has been discontinued by Costco and replaced with a GMO-free version. You can read about how I found out about it by clicking here. Should be in stock by mid-May everywhere. You can see the new container and nutritional information/ingredients here. Kirkland Signature Infant Formula is the Costco brand of infant formula, and coming in at roughly half the price of the competition and having nutritional specs that met or exceeded the other brands, we had to try it. I’ll use Amazon pricing here, but for once the Amazon pricing without tax and the Costco price with (at least in my state,) are about the same. Coming in at about $24 per 36 oz can, the stuff looks like any other baby formula, but smells slightly better to me. Baby M picked it up and drank it from day one with no issues. Although it may be coincidence, rates of puking immediately after formula feed have gone down. The can is easy-open, although I would suggest as with any other formula that you open in advance with dry hands lest you end up with some formula made on your hands. The scoop appears to be slightly larger than scoops from other brands, but not significantly so to the naked eye. If I were to bet I’d say as opposed to saving 50%, you’re probably more in the range of saving 44%. This is just from guesstimating however so your mileage may vary, and I could have just been fooled in my scoop estimations. Shaking it up it seems it dissolves slightly better than the others, but I may just be a Costco fanboy and looking for something other than price to set this thing apart from the rest. As I have a healthy happy baby girl who enjoys this formula and has disliked other formulas before, this becomes my #1 powder choice in my baby feeding arsenal. 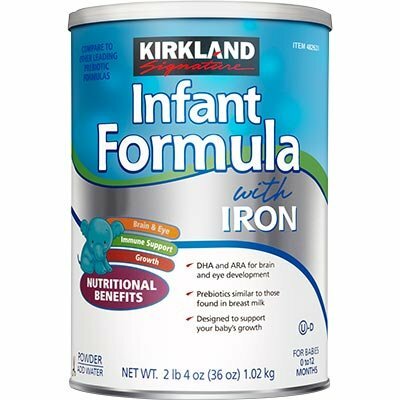 Kirkland Signature Infant Formula is available on the Costco website in various forms for members, in every Costco I’ve been in, and for you non-Costco folk it’s available on Amazon for $24.53 for 36 oz, $64.96 for 108 oz, or $130.40 for 216 oz. In order, that’s $0.68 an ounce, $0.60 an ounce, $0.60 an ounce (tie), so no real incentive to go with the 6 pack, but an $2.87 savings per can to go with the three pack. Update: 10/25/13: although I still consider this the formula to buy, Maggie has decided that the Target store brand Up & Up is her new favorite. Update: 9/3/14: Maggie hasn’t drank formula in quite a while now, but that was her second favorite near the end of formula days only slightly behind Target’s version. As I recall the pricing is now more near $18 in store for the Costco/Kirkland versions. It was good, but it wasn’t everything we needed. Almost was. Since people have been asking for ingredients and packaging, here’s a picture of my dinged up can from September 2013. 36 ounce can, which is 1020.582 grams. Each scoop is 8.7grams and produces two ounces of baby formula. There should be 117.31 scoops, or 234.61 ounces of formula per can. ← Daycare: T-6 days – daddy and baby at home – a running descent into madness?